When I was 9 years old, my uncle gave me a handful of coins from Australia. I had never seen money from another country before, and up to that point it hadn't even occurred to me that everyone doesn't use the dollars and cents I was used to. I kept the coins in my desk, curiosities that were too interesting to just throw away but not yet interesting enough to store properly. When I was 11, I found a Mexico 5-peso coin in the dirt, and was convinced that I had found treasure. My father took me to a coin shop, where I found out that the coin was neither rare nor valuable. In the drawer it went. It wasn't until I was a teenager that I found the coin shop at the town mall, with its "junk" box of foreign coins - 10 for a dollar. From that point on, I was a collector of world coins. I found out about coin folders ("flips") and binder pages, and started storing my coins properly, labeling each with a pencil I reserved only for that purpose. I found out about the Standard Catalog of World Coins, which could help me identify my coins (this was before the Internet) and give me ideas of their value. I found out about coins made of silver and other precious metals, and how just because a coin is gold in color doesn't mean that it is made of gold. But mostly I found out about coins and their countries - how Australia's coins have animals on them; how Japan has a coin with a hole in it; how Great Britain puts a picture of their current king or queen on their coins (unlike the United States, which only uses older presidents on coins); how countries may come and go, but their coins can still be found in the backs of junk drawers or the bottoms of chests. 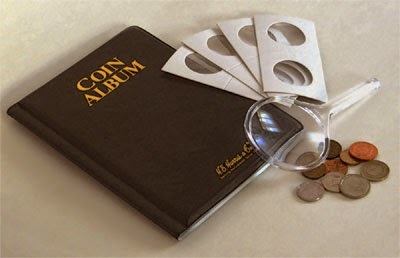 Now, as an adult, I want to help others not only get started with coin collecting, but to enjoy it. I created Portland Coins as a site that both informs the beginning or casual collector, and also sells the kinds of products I wished were available when I was young. In this related blog, I will be sharing tips, stories, and news to help new collectors, or even non-collectors, get more out of this fun hobby.